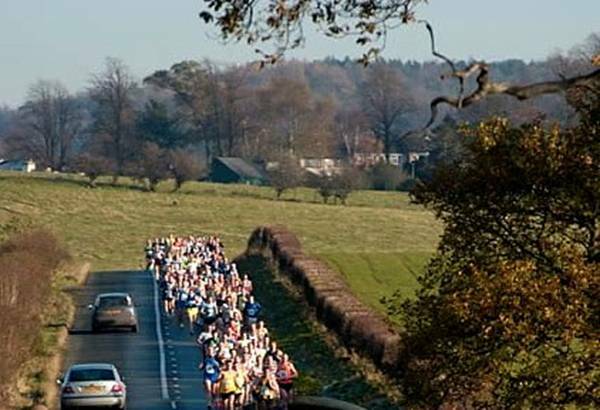 Although run in England, the Brampton to Carlisle Road Race is very popular with Scots and Scots have done remarkably well in the event. One of the problems over the years for men wanting to run in the race, was that it usually coincided with the Edinburgh to Glasgow Relay. That meant that most of the top runners could not run if their club was in the major domestic race of the winter season. Even if their club was not in the relay, then the atmosphere at this wonderful event persuaded many of those to go along and watch. The first Brampton was in 1951 and 2011 saw the Sixtieth Anniversary of the event. As an event outside Scotland, we will cover it from a Scottish point of view with notes of their performances where known rather than in a strictly chronological fashion. The race was over eight and a half miles when it was first organised in England when it was organised by Border Harriers in 1951, and the first five were won by Bill Boak of Elswick. Bill is now in his eighties and lives only a few miles from the finish. Border Harriers still organise the race but it has been long established as a ten mile event. The race starts in a village, follows the B6264 for most of the way and finishes in a city and usually attracts upwards of 600 runners. Originally, in the days of Bill Boak, it went straight from point to point but by adding in a loop it was easily made into a ‘ten’ which is advertised as the oldest ten mile race in England. The picture above gives an idea of the course and there is a short video clip posted by Tyne Valley Striders of their runners crossing the bridge at http://wn.com/Brampton_Carlisle which includes some (very) brief clips of some Scottish runners. Only two men have ever won the race three times and both were Scots. Jim Alder of Morpeth won the race in 1963, 1964 and 1965 and Alan Murray of Edinburgh University won in 1966, 1969 and 1970. Several English athletes have won it twice – Gerry North (Blackpool & Fylde) in 1959 and 1960, Nick Sloane of the same club in 1973 and 1974, John Calvert of Blackburn in 1977 and 1978, Steve Cram in 1984 and 1987 and Mike Scott of Border Harriers winning the club promoted event in 2001 and 2005. Ron Hill won in 1974 in 46:40 which was a course record but it only stood for a year with Sloane breaking it a year later with 45:50 which still stands. It is clearly a top class race and well supported by athletes of the highest quality which makes the successes of the Scottish runners all the more impressive. Scots have always run well in the race, and Ian Elliot of Edinburgh Southern won it in 1976 in a time of 47:50. It is hard to understand why there is no easily available list of winners from the start of the race either in print or on the net. Sandra Branney tells the tale of Alex Robertson going down to the race and entering on the day. He ran wearing a Barney Rubble T Shirt and went off fast. The rest of the field let him go thinking he would be back: he didn’t and went on to win. It was at a time when those entering on the day were not eligible for any award so he was off home without his deserved and earned reward! One of the best runs that I have noted was that of Andy Brown who won it in 1962 in the superb time of 48:37. In 2011 the local Brampton newspaper reported that only four men in the last 20 years had been sub-49 minutes for the race. The Scottish women have possibly done even better than the men though. Hayley Haining is the only woman to have won it three times (2004, 2005, 2006) with Lorna Irving (1983 and 1986), Lynne Harding ((1994 and 1996), Sandra Branney (1997 and 1998) and Lynne MacDougall (2000 and 2001) all winning it twice. Between 2001 and 2009, Clydesdale Harriers supported the race and the women won several individual and team awards with the veteran women taking first place no fewer than five consecutive years (2005, 2006, 2007, 2008, 2009). Not only did they win the Lady Vets and Ladies races in 2006, but in 2008, Scotland provided all three award winning teams in the Ladies and Lady Veterans races. Only Scots have won the race three times – two men and a woman. What’s the attraction of the Brampton? Hayley Haining says that she really likes the race for several reasons: first, the course is flat and scenic as it winds through the little villages outside Carlisle; second she has found that with a lot of men running at around her speed, she can get a good race instead of being in a “no-man’s land” for most of the race. She adds that ironically the course is registered as being a downhill course but it has a long killer hill at the end as you climb up into Carlisle. We can start with Hayley’s three wins and two course records. Hayley Haining only ran in the race three times and won all three. In 2004, she was twenty second in 56:27 which saw her two minutes and eleven seconds and twenty seven minutes ahead of the second woman. Then in 2005, she was eleventh overall in 54:50 with second Lady 24th in 56:35. First Scottish man (Blair Matthew, Calderglen) to finish was one place and three seconds behind her. Finally in 2007 she was timed at 54:31 for eight finisher overall. At the time she was a Lady Vet 35 and the next Lady was 24th in a time outside 57 minutes. Not only that but she was first Scot to finish with the first man (Marcus Scotney) being two places behind in 54:59. A quite remarkable record and she is still (in 2012) still the only three time winner of the women’s race. Sandra Branney won the race in 1997 and 1998. On one of these occasions she arrived at Brampton, did her usual pre-race strides and went to change into her race shoes only to find that she had brought the wrong shoe bag! Her racers were back in Carlisle leaving her with no option but to run in a cheap pair of old trainers. So annoyed with herself was she that she took off at the start like a rocket – not at all her usual start. But she won which is what counts. Another memorable race was in 2004 when she turned 50. Pete Mulholland kept age-group records and pointed out that Paula Fudge had the ten mile record at 60 minutes +. Sandra really wanted the record so targeted the Brampton. Race day, perfect weather, no wind. She ran 59:06 and was highly delighted. Pete confirmed that the course was legal despite the alleged drop mentioned by Hayley above. Third Lady and of course first in her category. Lynn Harding was born in Milngavie but lived in the Newcastle area doing most of her racing in the North of England. Lynn won the Brampton to Carlisle in 1994 (Commonwealth Games year where she ran in the Marathon) and 1996. I mentioned the women from Clydesdale Harriers earlier and would like to expand on that – mainly on the veteran women. Five firsts, two seconds and a third in five years is not bad going. There had been several men from the club going down with Allan Adams the most successful, having a best time of 49:35 when finishing third in 2003 before the club started to send a group of runners to the event. In 2004 Pamela McCrossan was second LV 40 and the vets team was fifth. Possibly encouraed by that the team made a point of sending a good team down and in 2005 they had two team awards. The Lady Vets team of Ann Murray (3), Pamela McCrossan and Aileen Scott won the race and were second in the open ladies team race where Ann was eighth, Pamela tenth and Aileen sixteenth. In 2006 they did even better by winning the overall women’s team race (Melanie Douglas in fifth, Pamela thirteenth and Aileen twenty first) and the vets as well with the counters being Pamela, Aileen and Marina McCallum with Pamela third LV45. 2007 saw the hat-trick in the vets race when Pamela (9), Ann (11) and Kath Scott (12) won the vets race and were second the open race. Pamela was third L45 and Ann was third L40. In 2008 they did it again – first Lady Vets team and third overall with Pamela, Ann and Kath being the heroines this time. Better still, Pamela was the first Lady Vet to finish and Ann was the third L40. They went back in 2009 but without the same degree of success – the Lady Vets team on Marina McCallum, Aileen Scott and Kath Scott was third and the trio were fifth in the overall race. Pamela reckons that she won a vets prize and a team prize every time she went to the race and her 10 miles pb was done in 2008 when she was clocked at 64:27 They haven’t been back since but the series of first places and fine individual runs kept up the Scottish tradition of doing well at Brampton. Hugh Barrow travelled down in 1959 and won the Junior race by ten yards in the one and a half mile race: see the picture and story above. .